Ultrasound examinations are of little value in examining organs that contain air.Ultrasound waves will not pass through air and therefore it cannot be used to examine normal lungs. Bone also stops ultrasound waves, so the brain and spinal cord are unable to be seen with an ultrasound study,and obviously, bones cannot be examined. M-mode (motion-mode) is a type of B-mode in which a tracing of the motion of the structure being scanned is displayed. A combination of M-mode and2-dimensional ultrasound are used for examining the heart walls,chambers and valves to evaluate cardiac function. 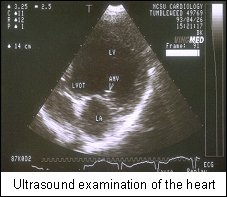 Cardiac ultrasonography is usually referred to as echocardiography. Doppler ultrasound is a specialized form of cardiac ultrasound in which the direction and speed of blood flow in the heart and blood vessels can be measured. Color-flow Doppler technology makes it even easier to observe the flow of blood through the heart and important blood vessels.